Pattern colour: Pale curved markings on elytra; green metallic highlights (visible under a microscope). Leg colour: Black or dark brown with metallic reflections. 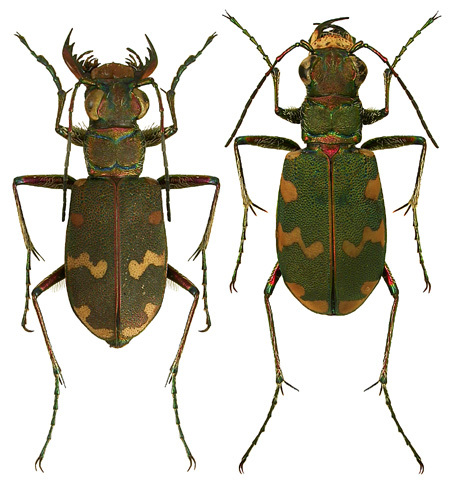 UK Priority Species data collation Cicindela hybrida. Status: Local but can be abundant. Known only from Lancashire and South Cumbria. Habitat: Dunes, lowland heath and open grassland. Other notes: Head as wide as pronotum. Labrum pale without central ridge. 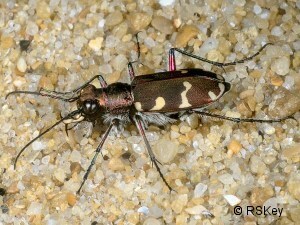 Sides of thorax and underside of abdomen with dense white hairs. Elytra with three curved marks on each, the central bandbent medially at about 45°. Surface with minute punctures. Aedeagus curved apically, internal sac with two sub-apical teeth.